The I’m outraged at ……. season has begun at Biffer command and watch out if your skin is slightly more tanned than theirs… you’re going to get it. As sure as eggs are eggs Poppy anger rolls into Christmas being banned, into Easter being stopped into St George’s day and then back to Remembrance Day again. You can set your watch, calendar or phone by it when frothing biffers recount tales of unicorns and pots of gold at the rainbow’s end – or lies as we like to call them. The first unicorn instance started early, a guy in TfL uniform was accused of telling a poppy seller to get orf the land, cue outrage and the frothfest began. One of my colleagues actually sent a comment to TfL about it and was told that it happened in 2013 and he was actually protecting her. But it was enough for the bigots to fire the starting pistol on Muslim bashing. The next unicorn instance came as England cricket players left to go to the ashes down under. In a team picture Moeen Ali didn’t have the obligatory poppy on his suit for the team picture, although he did have one later when they landed. But this was enough to start the foaming with super suds. Now I’ve actually met Mo at a cricket against racism event at the Oval, and I have to say he’s a lovely bloke. He is so proud of pulling on the Three Lions shirt, kisses the badge when he scores a ton and proud of representing his country, something Screechy and Goldibollocks and the high command can only dream of. If Moeen says it fell off I believe him more than the fucknuggets at Biffer Towers. I noticed that as news of Moeen’s slip broke, Screechy and Goldibollocks were protesting about something or other and didn’t have Poppy’s on and neither did have the majority of supporters but we won’t make a fuss. As regular followers of this page will know Screechy, Goldibollocks and the high command have a bit of previous with Poppy’s, the Royal British Legion and the false patriotism that they attach to it. They also have short memories about respect unlike Moeen. These are not made up details they are actual facts. 1. whilst an erstwhile member of the BNP Goldibollocks decided to wear underwear on his head at the cenotaph (rumours of them being Steve Lewis’s are as yet unproven) I haven’t seen Moeen do this as I suspect he thinks this is disrespectful. 2. The biffers try to sell poppy tat. The high command and the shittroopers have peddled their own crappy merchandise despite being asked to stop by the RBL. They didn’t and no money was ever received by the RBL even though the biffer blurb told their sheeple it would. The RBL have also said they wouldn’t take anything from them as they don’t accept donations from a political party. So Screechy and Goldibollocks have pocketed the dosh. There’s a video about too where an old man confronts Goldibollocks and a shittrooper about selling this. Goldibollocks in true biffer style then runs away. I doubt Moeen would have done this as it would be theft and a little disrespectful. 3. Last year Goldibollocks and Screechy sent their shittroopers out to various shopping centres and places where poppy sellers were. They instructed their accomplices to get selfies with the sellers and then posted these on Facebook saying they were guarding them from lefties and Muslims. This caused a such a furore as parents and military cadet organisations to request the removal of the pictures and had to issue statements to the effect of they didn’t know who the biffers were. Moeen I expect would only take selfies with fans of England Cricket, he’d never take selfies to pass them off as guarding pictures as that would be disrespectful. So there you have it, a misplaced poppy, a foamfest from the cockwombles and racist comments from the bifferati. But there again who is the more disrespectful, Moeen Ali, a cricket player who proudly represents his country or a group of scam artists who rip off the RBL, use kids to further their hate and worship a thundercunt who walks around with y fronts on his head. The decision is yours. The Poppy is the symbol of the Royal British Legion. When you buy a poppy from the RBL you are helping to raise money for veterans and their families who find themselves in need. But what does the poppy represent? World War I, ‘The Great War’ as it was known by those who lived through it was fought in many countries on different continents by combatants from across the globe. It was fought on many different ‘fronts’ from Gallipoli in the Dardanelles to Arabia and Belgium, from Egypt and China to Flanders and, of course to the Poppy fields of Flanders. 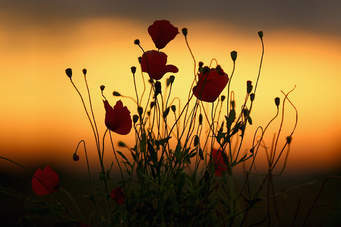 The Western front followed the line of the Somme where, in the lazy heat of summers before the war, the landscape had burned red, not with fire or with blood but with the vivid red of thousands upon thousands of wild poppies. As four years of trench warfare dragged on the poppies mingled with the blood and the bones of the fallen from both sides until the poppy itself became associated with the wounded and the dead. Eventually even they disappeared under the morass of mud and decaying flesh but not before they found a symbolic place in the hearts and minds of a generation. Wave upon wave of reinforcements did indeed ‘take up the quarrel with the foe’ and wave upon wave met their end, not only in the long lines of trenches that scarred the landscape of the Western front but across the globe. 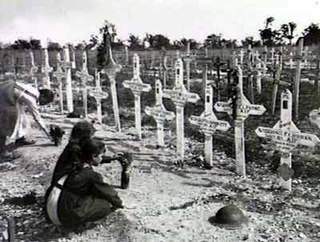 51 long months of war resulted in the deaths of 11 million combatants and 7 million civilian men, women and children. 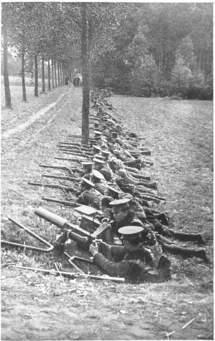 An additional 20 million were injured as a direct result of the war. This makes the period from August 1914 to November 11th 1918 one of the bloodiest episodes in all of human history. The localised conflict between Austria and Serbia that began on July 28th 1914 quickly escalated to encompass the globe with Germany declaring war on Russia on August 1st and on France two days later. Great Britain joined the war on August 4th 1914. Four years of stalemate in France and unimaginable slaughter in other theatres of conflict created a protracted war of attrition with each side ‘throwing men to their deaths’ in the hope that the enemy’s losses would be greater and more damaging than their own. It was a brutal, cynical time as commanders on both sides ordered sacrifice upon sacrifice, the British at sites like Ypres or Amiens, the French and Germans at the ancient fortress of Verdun. In the end, Germany blinked first. Kaiser Wilhelm surrendered, his exhausted and greatly depleted forces were no match for the renewed vigour of his enemies following America’s entry into the war. Hostilities ceased at 11am on the 11th November, 1918… the eleventh hour of the eleventh day of the eleventh month, as it will forever be known. 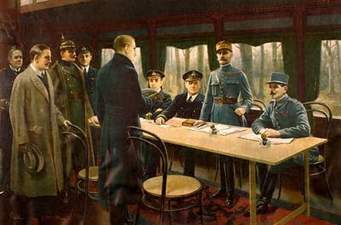 On June 28th 1919, exactly 5 years after the assassination of Franz Ferdinand (the event that triggered The Great War) the victorious allies had the Germans sign the Treaty of Versailles. The treaty came complete with a commitment to crippling reparations in compensation for the losses and costs of the war. The payments would cripple the German economy and ultimately lead to World War 2 after what one French soldier, Marshall Ferdinand Foch described not as a ‘peace’ but as a ‘20 year armistice’. He was correct, almost to the day. When we combine the armistice of November 11th with the image of the poppy we have a powerful symbol of remembrance, of gratitude and of peace. The poppy represents both the tragedy and the heroism of war. Here in UK it also symbolizes the work of the Royal British Legion, its fundraising and the charitable assistance it provides to the families of the fallen and to surviving servicemen and women in need. That’s why we urge you to buy your poppy from the Royal British Legion and in some small way give something back to those who bought and continue to pay for our freedoms. We thought we’d have a break from the negativity of Britain First and take some time to appreciate the selfless courage and sacrifice of those who have defended freedom and liberty across the globe instead. Even the EBF team gets weary of constantly reviewing the antics of our species’ worst and most hateful, bloodthirsty members. So just for one day we’ve published a series of articles about real heroes instead. Each hour from 11am on November 11th 2015 sees a different article on the EBF blog – an article that focuses upon courage, selfless heroism and the lived reality of war with all its human costs. Taking bravery in conflict as our theme we’ve collected these articles into a single PDF document. Along with the rest of the day’s EBF activity on Facebook and Twitter, these articles are our way of honouring the courageous, the wounded and the fallen heroes of armed conflict from 1914 until the present day. Here at EBF we’re dedicated to peace but still respect those thrown into battles they never chose but who rose to the occasion anyway. These are the men and women who fought and died for the freedom that we Brits continue to enjoy. These are real heroes whose courage and sacrifice represent a debt that can never be repaid. We hope you’ll find this set of Armistice Day blogs inspiring. It’s possible to despise war and yet still appreciate the valiant individuals who, when faced with unimaginable horror still found it within themselves to give their all. Please consider making a contribution to help those who gave so much and to support their families by donating as much as you can afford to the Royal British Legion here. You can view all the day’s posts on line by clicking on the blog category here. On November 11th 2015, Exposing Britain First will remember the 11 million military personnel and the 7 million civilian men, women and children who lost their lives in The Great War. We also will take the opportunity to commemorate those who have fallen in future conflicts in defence of our freedoms and especially in the defeat of the Nazis during World War II. 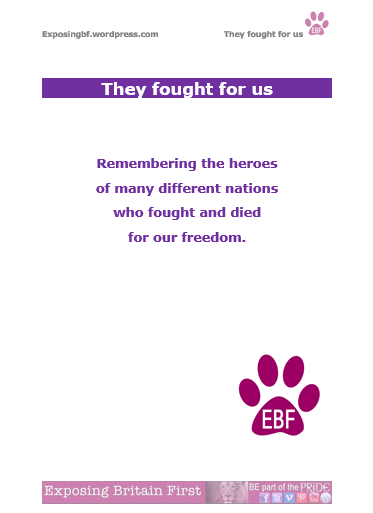 It was the struggle against Nazism in the Second World War that led to the freedoms of the modern world and it is in defence of those freedoms that we at EBF are dedicated. We aren’t exactly soldiers and most of us have never been on an active battlefield but that doesn’t prevent our respect for those who have. It certainly doesn’t keep us from trying to protect the freedoms and liberties for which they fought, freedoms that Britain First would remove from this wonderfully diverse country and its citizens. We don’t want to glorify war but equally we think it appropriate to remember those who were caught up in it. Wars are started by politicians but on the whole, they are fought by ordinary people. Governments start wars but those who are governed die in them. There have been many heroes from across the world who fought on behalf of freedom for all people. These individuals faced great dangers and often lost their lives in defence of the liberties that we Brits enjoy today. It is right that we honour their sacrifice, that we remember their cause and that we do what little we can to alleviate the suffering of the wounded and the bereaved today. Beginning at 11am on November 11th (the eleventh hour of the eleventh day) we will publish each hour on the hour a series of blog posts in honour of those whose lives were lost in both World War I and World War II. Each blog will contain a link to the Royal British Legion site where you can donate to support those who remain. If you have a story to tell, perhaps about your own relative or even about yourself and your experiences in wartime let us know. Send us your articles and we’ll do our best to include them. Please note however, the focus of the day’s blogs will be remembrance of war, not upon the evils of Britain First. There are 364 other days in a year to expose modern Nazism. On Armistice Day we’re much more concerned with remembering those who beat the Nazis down last time than with focusing upon their modern ideological descendants. You can submit your articles for inclusion on the day and/or in the PDF collection by emailing the EBF blog at exposingbf@hotmail.com. It’d be great to include more from our supporters. Please note that EBF does reserve the right to edit for spelling and grammar, to correct inaccuracies and to provide internet links if necessary (including the link to the RBL for donations). We also reserve the right to reject articles that don’t fit the themes of the Armistice Day project as a whole. This link leads to a special blog category which we have developed specifically for Armistice Day. Every one of our hourly blogs will link to it so all you need to do is click here to follow the collection as it unfolds on Armistice Day. We will also produce a PDF collection of all the blogs in the series which will be available for download from 11/11/15 onwards, complete with links to the Royal British Legion should you wish to make a donation to that great cause.